If you ask me it's a crime Optimus Prime wasn't around to be part of the original Sgt. Pepper's Lonely Hearts Club Band cover! While most of the faces here aren't as iconic as Prime or the Fab Four, it is a sure sign the 'Bots are getting acclimatised to earth culture! 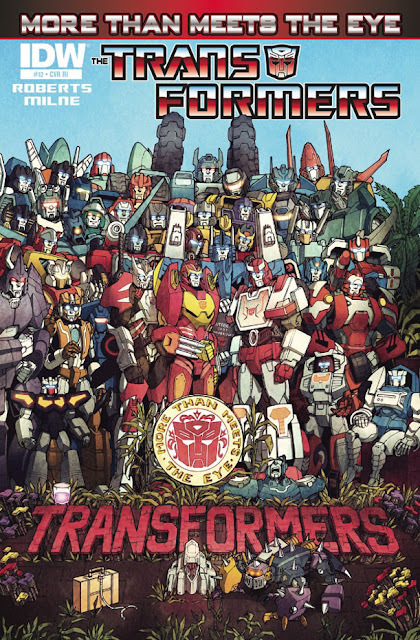 IDW says: AUTOBOTS VERSUS DECEPTICONS! The crew of the Lost Light confronts a band of rogue DECEPTICONS - with terrible consequences. As an AUTOBOT slips closer to death, a single decision sets in motion a chain of events that might just spell the end for RODIMUS and his band of travellers. CLOSE CONTENDER: Joe Corroney - Star Trek 100 Page Winter Spectacular 2012 Come on, when is two Spocks ever really a bad thing? He's the star of the show - so it's almost as good as Spider-Man getting a clone at Marvel! Wait... Spidey did get a clone?... It wasn't that great?... Really? Oh, well at least this is 100 pages! Other IDW December 2012 highlights include; Creator James O'Barr returns to his creation in The Crow: Skinning The Wolves #1, Target: Snake Eyes ends in Snake Eyes and Storm Shadow #20 with a brawl between the title holders, and Starscream gets the chance he's always wanted in Transformers: Robots In Disguise #12! What do you think? Sound off below. 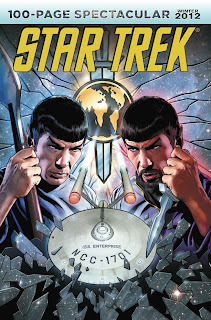 For December 2012 solicits from other publishers as they're released click here, or for more IDW, follow the jump!